Whether you’re a green juice fan or you’re still on the fence, here's what you need to know about this trendy beverage. The word "juice" used to conjure up images of drinks that were orange, yellow, even red or purple, but today, the hottest color in juice is green. Green juice is everywhere, and itâs become so synonymous with health that many of my clients think theyâre doing something wrongÂ if theyâre NOT gulping it down each day. Still, many consumers are skepticalâa recent survey revealed that 28% of Americans think green juice is scary looking. Yet, the same survey found that while nearly 9 out of 10 believe that eating produce is better for them, about two thirds say drinking it is more convenient. Whether youâre a green juice fan or youâre still on the fence, here are five things you should know about this trendy beverage. We normally associate greens with bitterness, so a mouthful of liquefied veggies may not seem very appealing. But many green juices are also blended with a bit of fruit such as apple or pear, along with flavorful mix-ins including mint, lime juice, and ginger root. If youâre not a big fan of spinach, kale, and Romaine in their leafy forms, look for or prepare blends with these additions. You may be surprised how sweet and flavorful they can be. The carbs can add up quick! 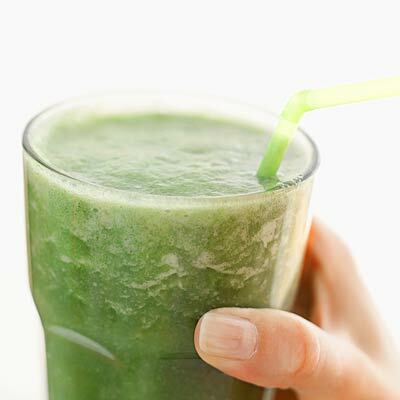 To make green juices more palatable, some recipes include far more fruit juice or pureed fruit than veggies. And when youâre sipping down a big bottle, the carbohydrate content from all that concentrated fruit can really add up. One common pre-made product has 44 grams of carbs in a 12-ounce container, and two other popular brands pack 56-66 grams per 16-ounce bottle. That's the amount in half of an entire pineapple, or three small bananas (in other words, more than youâd ever eat in one sitting). While your body may appreciate all the antioxidants and vitamins, it's important to keep in mind that a surplus of carbs can wind up feeding your fat cells. Juicing can be a great way to squeeze more produce into your diet, but drinking it isnât the same as eating it when it comes to fullness. Research shows that even when fiber is added to juice, itâs not as satiating as whole produce. The act of chewing, the additional time it takes to eat whole veggies and fruits, and the space they take up in your stomach all affect how full you feelâboth while youâre eating and afterwards. So if youâre trying to lose weight (or cut back on snacking between meals) youâre better off eating a salad or nibbling on raw green veggies like broccoli florets, snow peas, sliced bell pepper, cucumber slices, celery stalks, or string beans. The biggest downside of trendy foods: they soak up all the limelight, and leave their healthy counterparts in the shadows. Yes, kale and other greens are good for you, but so are red veggies (like beets, peppers, and tomatoes), as well as yellow and orange plants (including carrots, sweet potatoes, and squash), blue/purple veggies (such as eggplant and cabbage), and even white options (like cauliflower, mushrooms, and onions). The truth is, eating a wide variety of vegetable types and colors is an important strategy for optimal health. One study, which looked at the consumption of 26 commonly eaten veggies in more than 450,000 people, found that regardless of the amount, the risk of lung cancer decreased when a wider variety of vegetables were consumed. Another compared the effects of eating two diets with same quantity of produce, the only difference being the degree of variety. When a wider array of produce was consumedâ18 types versus 5âresearchers saw a significant reduction in oxidation, a marker for premature aging and disease. These results make lots of sense, because each plant food contains unique disease-fighting substances, so eating a wide variety of veggies exposes your body to a broader spectrum of protection. If you rarely ate veggies before and green juice has helped you fill the gap, thatâs great. But set another goal of mixing it up to get most bang from your vegetable buck. One ready-to-drink bottle of green juice costs anywhere between $3.50 and $11.00, depending on how itâs made; and a good home juicer or high powered blender can easily run $500 or more. If youâre trying to eat healthier and youâre on a budget, there are more affordable ways to fit in the recommended five to nine daily servings of produce, including starting your own organic garden, joining a CSA, shopping for in-season produce at your local farmerâs market, and even relying on frozen options (check out my previous post on the 5 Reasons This Nutritionist Buys Frozen Fruits and Veggies). Bottom line: green juice is hot, and it has its benefits, but itâs not a necessity. Consistently eating your greens (and other colors) whole, in the right amounts each day, offers plenty of rewards.